SS501 Park JungMin went to support Kim HyungJun who is acting in a musical play. On 28-Nov, Park JungMin went to BaekAm Art Hall at SamSung-dong and watched Kim HyungJun’s musical ‘Café in’. Park JungMin already pre-empt his visit through twitter on 27-Nov. After Park JungMin left a notice about his visit, he went to the theatre, Kim HyungJun and fans were surprised at this. 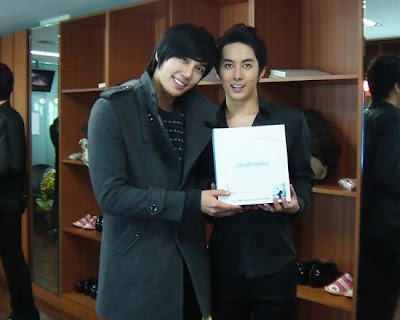 Park JungMin who is very senior-like since he debuted before Kim HyungJun in musical plays, and gave a humidifier to Kim HyungJun in order to protect his throat. Earlier on, Kim HyungJun went to find Park JungMin at his new album music video filming site to support him, displaying their warm friendship.